These are a fun twist to the plain rice krispie treat recipe. 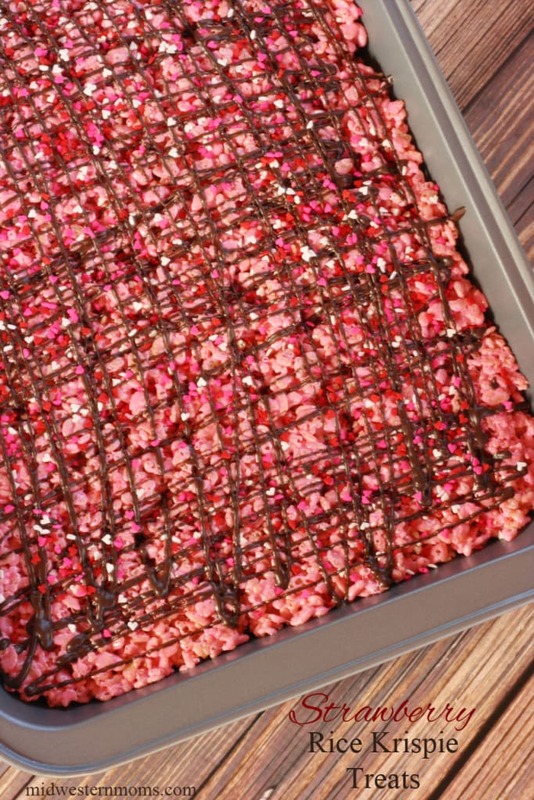 These Strawberry Rice Krispie Treats are topped with dark chocolate and sprinkles for a delicious treat! Aren’t these the cutest thing?! I was so excited about how these turned out. My son actually had fun watching me make these treats. He is three and is starting to want to help out in the kitchen. Since this recipe is done over the stove, I had him watch. He loved observing the butter and marshmallows melt. The strawberry rice kripsie treats recipe is just a slight variation of the original rice krispie treat recipe. 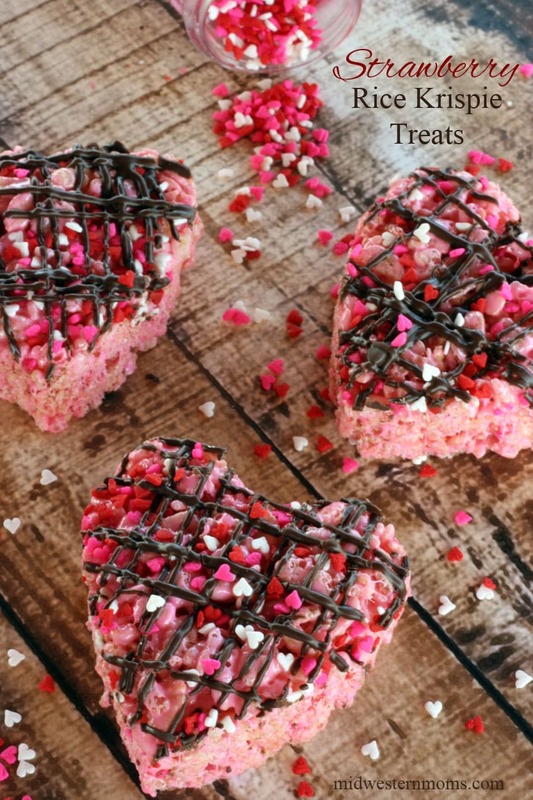 Delicious rice krispie treats with a hint of strawberry flavoring and topped off with dark chocolate and sprinkles! 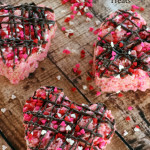 Rice Krispie Treats with a hint of strawberry flavor and topped with dark chocolate! Once the marshmallows are melted, add the rice krispies. Press the mixture into a greased 9×13 pan. Add the sprinkles and press them down onto the treats so they stick. Allow the treats to cool in the pan. Melt some dark chocolate wafers and drizzle over the top of the treats. Once the treats have cooled completely, you can either cut them into squares or into heart shapes. To drizzle the dark chocolate, place it in a sandwich bag and cut a small hole in one corner. This is going to be perfect for daycare (and mama)! Thank you for sharing! Just when I was about to give up on rice crispies – you draw me back in! Such a cute idea! Never thought of adding strawberry extract and I love how pretty pink they are! Stopping by from the SITS link up. Pinning! Adorable. My 17-year-old daughter’s boyfriend (alas…sigh) is rather a nut about strawberries, and he is VERY hard to buy gifts for. So maybe these will save Valentine’s Day this year? In case they do, thanks in advance! Stopping by from Worthwhile Wednesdays! What a great idea for valentine’s day or really anytime. Love a pretty treat! How perfect for Valentine’s Day treats! Pinning to my Valentine’s Board on Pinterest. Thanks! Do you know how many hearts you get out of one batch? These would be perfect for my sister’s wedding but I’d like to know how much to make! Thanks. Crud, I don’t remember. I should have wrote that down and not sure why I didn’t. Maybe 10 to 12??? I am totally guessing. Hi Devon! Im excited to try this recipe. I love strawberries and the flavor. However, what do you mean by “chocolate wafers”? I’ve never heard of these. What are they? Who makes them? Where can I find them? Thanks for this time and for sharing your recipe. Hi Cindy! I LOVE using Ghirardelli Dark Chocolate Melting Wafers. I found them in my local Walmart around the baking supplies. The aisle where you would find things like almond bark. If you can’t find them there, I am sure Amazon would have them.